Rahul Dravid cutting Stuart MacGill for a boundary, removing his cap and raising his bat in celebration is an unforgettable sight for Indian cricket fans. It was Adelaide, 2003, and India had just beaten Australia in Australia for the first time in more than 20 years. Dravid was the Man of the Match, having made 233 and 72* in the game. It was a special moment for the non-striker too, although he hadn't faced a single ball. Ajit Agarkar had set up the famous win, with a spell of 6 for 41 in the second innings which gave India an opportunity to push for a win after both teams had scored 500+ in the first innings. What are your first memories of that game? Rahul hitting those winning runs. Till then we didn't know that we could win a Test in Australia. It was my second trip; some of us had been there in 1999-2000, it was quite a tough lesson against arguably the best side in the world. To go back and... in Brisbane Australia played really well but we managed to draw that. So Rahul hitting those runs is my first memory. He cut Stuart MacGill, and I was at the non-striker's end. We needed only four and I think Parthiv Patel got out, and I don't think I faced a ball. It was a special moment to witness it from the other end. I always liked bowling at Adelaide. In 99-2000 I got five wickets in the game. It's one of those grounds where although the wicket was pretty flat, sometimes some grounds give you a nice feel about it. In the first innings I got a couple of wickets, Gilchrist and Katich. It was tough, Australia scored 400 on the first day and it was quite a flat wicket. 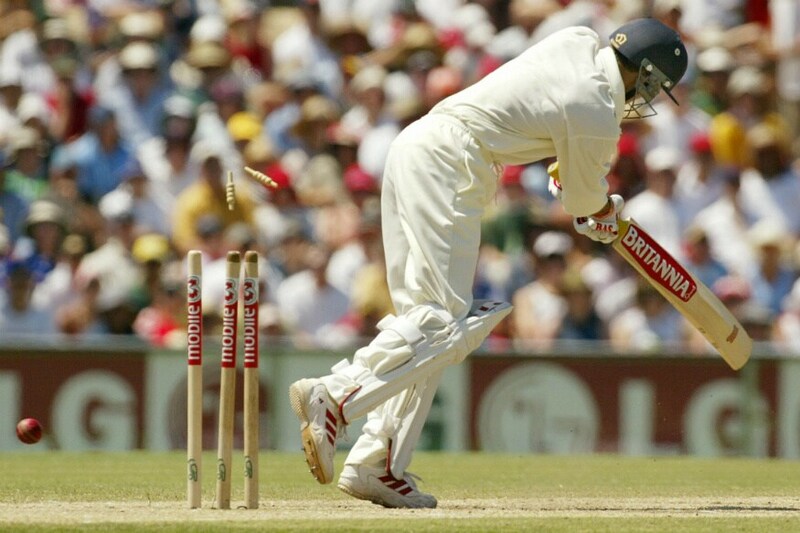 From what memory had in the 99-00 Test, on days four and five, the wicket went up and down. Thanks to that partnership of Rahul and Laxman, the scores were very close. We were not too far behind. There was still a fair bit of time left in the game where we could have been under pressure. The thing I remember the most was the Kookaburra usually swung. That particular afternoon we just wanted to bowl well, get some early wickets and put Australia under pressure. I don't think at that point anyone was thinking about winning the Test match because when there is 500+ runs scored by both teams and there's just one and a half days left on a good pitch, you don't think that you'll bowl a team like Australia out in their conditions and be in with a chance. Fortunately the ball swung. Swung into Langer. Ponting was in some form... he has been in good form all his life and had made a double-hundred in the first innings. It was probably a ball too close to him and maybe with the new ball, it bounced a bit more. Instead of cutting square of the wicket, it went behind the wicket and Aakash (Chopra) took a sharp catch at gully. That kind of helped. Two premier batsmen, and the ball was still new. Suddenly the middle order was exposed, although it was a strong middle order. It was one of those grounds where I sort of enjoyed running in to bowl. Always had a nice feel. Kookaburra generally swung for the first few overs, and if you get it right, you're always in with a chance. How were the celebrations like? Rahul was missing most of the time as he was busy doing pressers! We didn't see Rahul until a long time later. Obviously there was some champagne in the dressing room. Indian team had never been big drinkers, so it sort of happened very quickly. Obviously for the newer guys it was just as special, because it was a tough Australian team to beat inspite of not having Warne or Mcgrath. Maybe I'm speaking for other guys as well, but guys who had been in the 1999 trip - in most matches we were smashed then. At no point in that series did we ever look like having a chance. To then come back and then win a Test, it was quite emotional. Did it help that India weren't thinking about victory at the innings break? No, maybe I put it wrongly. Everyone was happy that the scores was this close so we were not chasing the game. If we had conceded a lead of even 100 runs, we knew Australia could put a lot of pressure on us. It was one of those things where we thought that if we got a couple of wickets, we could put Australia under pressure. It was a very good pitch, and if we had to chase somewhere around 200-220, we could. Maybe I put it wrongly, of course you want to win Test matches and funny things happen in the game. But the first thought was to get some wickets, and we got it. Everyone chipped in at different times. Do you revisit that spell by watching on YouTube? If it's on TV I watch it. It's very fresh in memory so I don't need to watch it. Any time you win a Test match, it's obviously special, especially away from India. In India you tend to win a lot. If you perform in those Test matches, it makes it even more special. So I don't mind watching it as many times whenever it's played on television. You were good throughout the series, the second highest wicket-taker behind Anil Kumble. Was it one of the highest point of your career? I think so. In 1999 I was highest wicket-taker among Indian bowlers. In both series I hadn't picked a wicket in Sydney, so all my wickets were from three Tests. I suppose it's a high point. We were in a position to win the series but we didn't quite get the job done. But to go and draw the series in Australia was tough. A lot of people back home had written us off saying we were the worst team to travel and all that. It usually happens. Nobody gave us a chance. To then compete and draw a series, you'd have to say it was special. Steve Waugh was retiring after the series and things were changing, but they were still a hell of a team. They still dominated 4-5 years after that. To beat them in their backyard, to draw a series in their backyard was special. I wish we had got the job done in Sydney, it would have been even more special. Another famous sight from the series is you raising your bat, after you broke the string of seven ducks against Australia. You're always fortunate every time you get an opportunity to play Test cricket for India. It was one of those things, it was very instinctive, very unlike me to really show anything on a cricket field. It was one of those things. People spoke more about the zeroes than about my bowling, unfortunately! That seemed to be the tendency. In 99, I thought it was probably the best I had bowled in my career and nobody spoke about my bowling after the series. For some reason I couldn't buy a run against Australia. Against the rest of the teams, my batting record wasn't so bad in Test cricket. For some reason - whether it was Mark Waugh or XYZ, I just couldn't get off the mark. It was one of those things, looking back, it's quite funny now. It was relief as well. Somehow I could get a single! Is the current tour the best chance to get a series win in Australia? You'll have to think so. I mean Australia seem to be all over the place even though our bowling attack seems to be back. It's not as straightforward as everyone is making it out to be. The batting doesn't look great on paper but they're playing in home conditions. You'd expect them to be more comfortable than in the subcontinent or even in England. I don't think we've ever had a better chance. We'll have to bat well. Our downfall has been our batting when we've toured. Our bowling seems to be in good shape. Every time we bat well, whether it's in Johannesburg against South Africa on a tough pitch, or Nottingham against England, our batters had managed to put some sort of score which was par for that Test. It is definitely our best chance since we've been touring Australia. At least since the cricket that I've been watching. I don't know if we're favourites, but it's very close. Australia might be favourites because it's at home but I don't think it has happened before. I don't think India has ever started on par with Australia going to Australia. What's your take on the current crop of Indian pacers? I think the variety. Another thing that Virat has got into the team is the fitness ethics. The guys are a lot fitter, you have to pass a certain bar to be there. And it helps. Being a bowler I know that if your physical condition is good, generally you're a lot stronger in your mind. You can push yourself that extra mile. It's the variety, you still have to bowl well. That comes with experience. Bhuvneshwar can swing the ball. Umesh can bowl fast and swing the ball. Shami has got a bit of pace and bowls straight, bowls a lot of wicket taking balls. Ishant has got the extra height, Bumrah has X-factor, whether he bowls with the red ball or white ball. He's played in helpful conditions so far, but how quickly he has adapted has been really good. The quality is there, it's how quickly they adapt that will be key. It'll be different from England or even South Africa, so how they adapt will be important.